Could Americans with Unapproved Opinions Be Financially ‘De-platformed’? Coming up we’ve got a wonderful interview with Frank Holmes, CEO of U.S. Global Investors. Frank talks about some key developments in the gold community and why he believes a key merger in the gold mining industry could be a good indicator of a market bottom. He also shares his thoughts about Vanguard’s recent decision that leaves many gold investors hung out to dry. 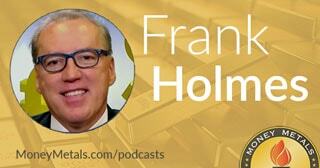 This is a must-hear interview with Frank Holmes, coming up after this week’s market update. Precious metals markets struggled this week against the forces of rising bond yields and a stronger U.S. dollar. Where have we heard that before? Despite these headwinds, gold is holding up pretty well as it trades around the $1,200 level in a narrow range where it’s been locked in for the past month. As of this Friday recording, the yellow metal comes in at $1,202 an ounce, up 0.7% for the week. Silver is off 0.3% this week to trade at $14.67 per ounce. Platinum is little changed at $825 per ounce. And finally, the palladium market is taking a breather after posting huge gains last month. Prices for the catalytic metal look lower by a slight 0.5% this week to trade at $1,075. As for the gold and silver markets, they appear to have based out and have the potential break out this fall. Spot silver prices started to generate some noticeable upside momentum last week but didn’t get any real follow through this week, however. A pickup in buying is more apparent in the silver bullion market where sales of silver Eagles surged in September to a total of 2.9 million. The Silver Eagle market appears to be off to a strong start in October as well. The U.S. Mint reported 350,000 Silver Eagles sold on Monday, the first day of month. That’s almost as many of the coins as were purchased throughout the entire month of May, when bullion demand cratered and coin premiums dipped to near record lows. Despite the recent pickup in buying, premiums on popular silver bullion products remain relatively low. And spot prices remain extremely low, making this truly a buyer’s market for the white metal. Customers who are new to buying physical precious metals often wonder how they might actually pay for them. It’s not uncommon for a customer’s bullion order to run into the thousands or even tens of thousands of dollars. Credit cards are convenient for smaller purchases, but they present problems for both customers and bullion dealers when it comes to big purchases. Credit limits, merchant fees, fraud prevention measures, and privacy concerns all add up to credit cards not being a viable way to buy a stack of gold bars, for example. Payment options vary from dealer to dealer. Here at Money Metals Exchange, we accept more payments types than the average dealer. We are an industry leader in accepting Bitcoin and certain other cryptocurrencies. But even in this digital age, an old fashioned check or money order is often the most efficient way for customers to buy bullion. Unlike other businesses that deal in lower cost, higher-margin products, the bullion business operates with relatively tiny profit margins. The only way we can offer coins, rounds, and bars with such minimal mark ups over spot prices is by cutting out credit card companies and middle-man payment processors and their fees. Those customers who do want to use Visa, Mastercard, or PayPal can still do so within certain price limits, but unfortunately we must pass on a 4% processing fee. And on that note, while it may sound strange for a company to charge for using a credit card, when you’re buying gold and silver you should be very leery of anyone not passing on the merchant card fee. If they aren’t, you ought to be concerned about how much they’re making on you. The entire credit card payment processing industry is controlled by just a few giant corporations that are pushing to create a cashless, checkless, all digital economy. Mastercard colludes with Google and Big Tech to compile comprehensive data on consumers’ behavior. And Big Tech now colludes with Stripe and PayPal to screen customers for their political opinions. It sounds dystopian, like something out of a George Orwell novel. But that Orwellian future has arrived. People with unapproved political opinions – most often those on the dissident right – are being financially de-platformed by the likes of Mastercard and PayPal. This week Alex Jones announced he is suing PayPal over viewpoint discrimination against conservatives. Alex Jones: Do I think my lawsuit against them was going to save the world? No. It's meant to raise an alarm to you, to We The People and to the president who's already taken action against big tech and their censorship. This is really a dangerous Draconian system where this global cashless society that surveils everything we do begins to persecute people for their political views and deny them access to the marketplace. It’s a David vs. Goliath battle – one that Goliath will be favored to win. Now that the multi-trillion dollar financial services and high-tech industries have set the precedent that they are in the business of taking punitive actions against right wingers, the intolerant left will push for corporate political repression to expand. One day, you might wake up to find your credit card or your PayPal account has been deactivated because you expressed a politically incorrect opinion on the internet. For now, at least, it’s still possible for the digitally de-platformed to walk into a grocery store and buy food using paper cash. But once cash is banned, as bankers, central bankers, and tech titans ultimately want, dissidents may have no other payment options besides speculative cryptocurrencies and tangible barter items such as silver coins. Mike Gleason: It is my privilege now to welcome in Frank Holmes, CEO and Chief Investment Officer at U.S. Global Investors. Mr. Holmes has received various honors over the years, including being named America's Best Fund Manager by the Mining Journal. He is also the co-author of the book The Gold Watcher: Demystifying Gold Investing, and is a regular guest on CNBC, Bloomberg, Fox Business, as well as right here on the Money Metals podcast. Frank Holmes: It's great to be with you. Mike Gleason: Frank, it seems like escalating tariffs and trade tensions have been the major topic on Wall Street since early last spring. We continue to be a bit baffled by the market's reaction, however. The President has gone from posturing to serious action with another $200 billion imposed on China a couple of weeks ago. The equity markets aren't particularly fazed near as we can tell. It is yet to move the needle on the trade deficit at all, though it is still early, but it is starting to show up in prices. We've been buying heavy duty racks for our storage vault over the past few months, for instance, and on a recent batch which we just ordered yesterday, the price rose some 10% from what they just were a couple of months ago, and the reason we were given was that the manufacturer is having to pay more for imported steel. You've called these tariffs a tax, Frank, and that's exactly what it is. Do you think the rest of America will notice much higher prices any time soon? Frank Holmes: Well, I think that the tariffs or the trade war is able to do what it is doing short-term because of the fiscal stimulus that took place last year with tax reform, and I think that that's why the market hasn't capitulated. Profits are still strong. We had a big run in small cap stocks, predominantly domestic stocks, and a small handful of big cap like Amazon in the markets, but there's no doubt that the trade and tariff war is going to impact… and we see it on steel prices such as if you're building a contemporary modern home today, you have to use more steel for the open space, and those prices, steel prices are up 35%. So you start to run these numbers through and you're seeing price inflation is going to come now with Amazon at going to $15 an hour, you're going to see the CPI number ticking up. That's what I really believe. If we also looked at the 1980 numbers and later on numbers for CPI calculations, inflation's running at 10%, so when they say it's 2.4 or 2.7, I find that really difficult (to believe). I noticed in San Antonio, our avocados used to always come from Mexico and no longer, and the prices are up and the quality is down. So, I do see that there's some issues on this trade war, but I don't think it's over, the trade war. And I think it's going to get worse because there's a real strategy against China. In the renegotiated NAFTA agreement, which is over 1000 pages, there are some policy decisions there that Canada and Mexico cannot go into a special pact with China, otherwise that whole agreement is thrown out the door. And same thing with South Korea, Mexico, Japan, there's a real push by the administration to go after China. Now the positive part is that Trump and his administration want to have zero tariffs everywhere and let the best athlete win. And the issues with China is that they are double standards and lots of protectionism. So, that battle is not over. There is also the big concern that China is trying to undermine the currency and have an alternative currency and that is something that Mnuchin and Trump are very concerned about. You wouldn't normally think when you have such a high interest rate differential. Today we're seeing two-year, five-year, ten-year government bonds all about the CPI number that's reported and when you look and compare to Japan at ten beeps for ten-year money versus 3.8. Germany, Europe is 60 basis points, there's something not right there and normally the dollar would actually be much, much higher. Gold would be under $1,000 and the fact that it's not is very constructive for the price of gold because any rollover in the dollar, in a slow down this economic engine, which I think is going to happen next quarter. By the end of this quarter we're going to get into what's called rebalancing our portfolios and I think that we're going to have some real issues there. Mike Gleason: One of the things we're likely to need in order to give safe haven assets like gold a boost, is a reversal of the seemingly never-ending stock market rally. Metals are often inversely correlated with stocks. Now, in terms of monitory policy and the feds plan to continue hiking rates, one of the key factors that's been driving this bull run in stocks has been the ability for companies to borrow cheaply and reinvest that debt into buying back their own stock, which has created a string demand for equities that thus pushed prices higher. Now that interest costs are on the rise and likely to be rising even more in the months ahead, do you anticipate the slowing down stock buy backs and might that be a key factor in bringing about this long awaited pull back in the stock market? What are your thoughts there? Frank Holmes: Well, from a global macro point of view, I have great concern that the Purchasing Manufacturers Index (PMI), which is a six-month forward-looking line, has turned negative, and has been negative for many months now. And China hit fifty… just marginally under there for manufacturing. And that means their demand for metals, for manufacturing goods is starting to dry up and we're seeing the same thing in Europe. So, global PMI's are negative, and that's not good for global trade. So the trade war battle is going to start showing up in the first quarter of 2019. So, that's a big concern. Now, the other more significant mega trend that's happening, and it's a great risk in America, is this whole thought process that passive investing is better than active management. One of the things I've always joked about is that, we cannot offer you an inducement of putting ten thousand dollars into our gold fund with a (free) toaster. But, someone else can come along and say, "We'll wave all the fees to induce you to come into our index", and that's okay. Both are inducements, and one is accepted, and one is not. And what we're seeing is this incredible inducement and I've gone around asked, "Is any law firm giving Vanguard free legal work for their indexes?". Nope, not happening. Is any of the accounting firm giving them free audits? Nope, not happening. So, how can they offer free? Who's paying? And this sort of trend in the past decade of free and growing, you've witnessed two trillion dollars has left active fund managers and gone into passive indexing. Those stocks within that index, a lot of them doing exactly what you started off with your question, buying back their stock. Therefore, their float is shrinking. And when these pension funds etc. all go to re-balance, as they did going from 1999-2000, and there's no bids, they just crashed. And that just became more exasperating. So, I think we're setting up for a big big crash in that stock market, that correction that's going to shock people and they're just not going to be able to find the buyers around. The other part is of 70% of all trading now is supposedly quant funds. And quant funds look for different metrics than the passive investing. Other researchers are showing that the number one factor now for picking stocks is not PE ratio, not capital, not cash flow multiples, not enterprises, it's just fund flows. So, if you can jump on a gold ETF because a bunch of fund flows goes in those names, then those stocks go up not because they have value metrics that are attractive or growth metrics. They are just going up because fund flows are going in that index. We saw this in a microcosm 18 months ago when all this money went into the GDXJ and, all of the sudden, they realized they bought ten companies or something, I forget the exact number, owning more than 20% of a company in Canada. Immediately they had to take over those companies so by quarter end, in three days they blew all those stocks. Two billion dollars in hitting all those bids and they crushed those stocks and basically created a rippling effect for all junior gold stocks. And then you get a bit of a, finally, cleansing of that and we had it now that Vanguard is getting other gold business and we were cynical about it and disappointed that our gold fund, GoAU gold shares, outperformed the Vanguard mutual fund for one, three-, five- and ten-year periods. But, it didn't matter they were two and half billion dollars, much bigger than us, we out performed them. You know why? Because, they're cheaper, 35 basis points versus 160 basis points, but we were outperforming. And allegedly cheaper is better. Well it's just not better if you're looking for performance and it's just not better if you really get someone who's dedicated. So, all these gold investors that went over there have been orphaned. And I think that those crowding into these indexes and saying cheaper is better is a real flawed argument and I think a lot of these RIAs have to look what their fiduciary and they have to do a balance of looking for performance. Mike Gleason: Yeah, that's very interesting that we have so much of that money going into these index funds and obviously a lot of money can go into it, and a lot of money can come out of it at one time. That could be a tipping point when we do see a rebalancing that you talk about maybe at the end of the year. That's going to be something to watch very closely. Those are great points. Now, the metals are showing a little strength over the past week or two after nearly six months of pretty relentless selling. We're learned to keep our expectations low, we're going to need a catalyst to see any serious fireworks in the metals, it seems. What are you expecting for the metals as we head down the stretch in the 4th quarter. It sure would be nice if gold and silver could end the year in the green but it's pretty ambitious at this point, perhaps. Gold needs to rise another hundred dollars an ounce and silver about two dollars and a quarter. What do you think, can we pull that off? Frank Holmes: Yeah, I think if we get something economic, say, the economy slowing down dramatically then rates start coming off, that will take the dollar down and gold will surge. I thought it was interesting with Turkey with all of its poor policies and religious based social policies over economic policies, that they've had to sell gold. What was the real interesting part with that whole thesis was that Poland, out of nowhere, Poland shows up and has got a bid for six billion dollars’ worth of gold. I mean, that was really a positive shock to the system. But, what's happened around the world is that many of these countries like Czech, Hungary, and Poland, they've basically voted in a more fiscally conservative leadership… both their prime ministers and presidents. So, I think that they're witnessing this whole printing. And in Europe, they basically vaporized one trillion dollars of non-performing loans that their central government bank basically bought all these loans and sent them into money heaven. Debasement of all these countries’ currencies and you see more conservative people that are highly educated, like in Poland, buying gold as a reserve. So, I think there are positive parts in light of all of this. I remain constructive, I've always advocated the golden rule and that golden rule is 10% in gold. Make sure you have that 10% and re-balance. And make sure if you're going to go re-balance your portfolio at this quarter end, that you do it, not starting in January, you start it before year end because you could get this huge correction taking place like we had going from 1999-2000. Mike Gleason: You recently reported about the announcement of a huge merger between mining giant Barrick Gold and Rangold Resources who will complete an $18 billion merger that will create the world's largest gold producer. Talk about why you think this may be significant for metal's prices in the months and years ahead. I thought your comments about that were pretty interesting in that recent Frank Talk piece. Frank Holmes: One of the things that's tickling me is that we were the original seed shareholders of Rangold. A little less than thirty years ago, we seeded that company. Mark Bristow's vision, who was a PhD in the platinum belts in South Africa. But it's looking at the green stones in West Africa where the great opportunities were. He's very focused on return invested capital and he's very focused on revenue per share and cash flow per share growth metrics, unlike many of the other majors and now he is the largest gold mining company in the world. He is a frugal guy and you will see him go in there and cut costs everywhere to let the shareholders have a higher return on invested capital. I think if that's the whole concept there, is this new discipline coming into the gold space. I think the last time we had mega mergers to save on cost was at the bottom in 2000, 2001 and 2002. There was several major M&A work that was done to stringer economy to scale. So, that's pretty positive for gold stocks. And the last thing to share with you is this whole thing with Vanguard's gold fund now leaving and taking the word out, they blew out two billion dollars of gold stocks in the past month. And that really hurt the overall PE ratios, cash flow ratios that make a lot of these gold stocks much cheaper and more attractive than the overall market. I think that that's something that investors have to be aware of… gold stocks are, like bullion and silver, are great buys. That's one reason we created GoAU, our smart beta, our quant approach to picking gold ETF's to compete with the ETF's so that they're like the GDX and GDXJ. And it's doing exactly what that quant model said it would do, it's far outperforming the GDX and GDXJ trade in its first year of performance. And, interestingly enough, we had a big turn over this quarter on the rebalancing, something like twelve names. Why was that? Because, a lot of stocks got compressed because of this blowout by Vanguard. They all of the sudden popped up as being extremely undervalued and any pop in the price of gold, these stocks will give you, not only probably a 3 to one ratio rise, maybe five or six. So, we remain constructively positive in the industry and do believe that we have peak gold. We do really believe that we're in that froze and there's no new technological breakthrough like we had last time when we (supposedly) had peak oil, the frackers came along and with technology were able to reverse that. There's nothing for gold. So, stay tuned to this station and remember the 10% golden rule. Mike Gleason: Well put. Yeah, obviously the whole Vanguard thing is quite troubling and people that have their money there should probably be thinking twice. I know that's not something Frank wants to say, but I'll say it. It's good thing that we have U.S. Global Investors out there who can serve the public well when it comes to that space. Well, finally Frank, as we begin to wrap up, give us any final thought here? And give out listeners an idea of maybe some of those key data points or geopolitical events or market events that you're going to be watching most closely in the near term that you believe will move the markets or anything else you want to hit on before we say goodbye? Frank Holmes: Just make sure that you're balanced. A big part is to make sure you have income, short term munis, short term government bond funds… to just make sure your overall portfolio is balanced. Not everyone jumping at the top and feeling they've got FOMO. I've heard this expression, fear of missing out was a big issue for Millennials. Well, it also is for old guys like me in a stock market that say, "I better jump in now, I've missed this big movement Amazon". Do not make investment decisions based on FOMO. Mike Gleason: Yeah, good point. I'll have to use that FOMO. I had not used that term yet. Millennials use it, I can see why. Well, I appreciate the time, as always, Frank, and we look forward to more of your great commentaries about the metals and the markets over the next few months of the year. We certainly look forward to dissecting some of those during our next conversation. Before we let you go, please tell our listeners a little bit more about your firm and your services and anything else people ought to know about you or U.S. Global Investors. Frank Holmes: Well, thank you. It's USfunds.com. Go there, check out the investor alert. We have tens of thousands of readers in 180 countries. We write every week about the capital markets and different asset classes and do a game film analysis. And then there's Frank Talk about my global travels. Take a look at my experiences of traveling around the world. You can be involved with our journey through investments. Mike Gleason: Well, it's excellent stuff, we definitely urge people to check that out. We've always enjoyed the information there and then also talking to you about that work here on our podcast. Thanks again Frank, enjoy the fall and we'll talk to you soon take care. Mike Gleason: Well that will do it for this week. Thanks again to Frank Holmes, CEO of U.S. Global Investors and manager of the GoAU gold fund. For more information, the site is USfunds.com. Be sure to check out the previously mentioned Frank Talk blog while you're there for some of the best market commentary you will find anywhere on gold and other related topics. Again, you can find all that at USfunds.com. And check back here next Friday for our next Weekly Market Wrap Podcast. Until then, this has been Mike Gleason with Money Metals Exchange. Thanks for listening, and have a great Easter weekend, everybody.